London's Charing Cross hospital is beginning trials this month of a system using barcodes on patients. Hospital authorities hope the system will improve patient safety by reducing drug-related errors on the ward. In England, five out of every 100 oral drug doses in hospitals go wrong, according to the Department of Health's most recent statistics. But most mistakes are not harmful, say officials, as errors typically involve missed or delayed doses. Charing Cross is one of just two hospitals in the world testing the new barcoding system, which links patients to a computerised drugs trolley, or Smart Cart, on the ward. Though many NHS hospitals use barcodes on patient's records to track the results of medical tests, it is rare to find the barcodes on patients themselves. 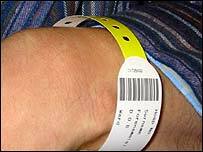 Patients in the Charing Cross study wear a barcoded wristband. 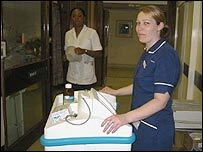 When nurses scan it during the daily drugs round, a drawer in their hi-tech trolley pops open with the patient's medicines. "We now zap our patients just as if they were in the supermarket," said Ann Jacklin, Chief Pharmacist at Charing Cross Hospital. "We were worried whether patients would mind being scanned like a tin of beans, but most of our patients quite like it. "They're familiar with the technology and enjoy the security they get, knowing they're being zapped," she told the BBC programme, Go Digital. The barcode links patients to their correct drugs through a combination of two other automated systems in the hospital. Doctors on the ward use a PC-based system to write patient's prescriptions. This controls a robotic picking arm in the hospital's main dispensary, which stocks up a digitally operated drugs cabinet which the nurses call a magic cupboard. The system, made by MDG Medical in the US, was introduced into the London hospital ward last year but is only now ready for formal evaluation. Hospital administrators will measure any reduction in drug related errors due to the system and whether it cuts the cost of drug rounds on the ward. Results are expected early next year. In his January report on improving medication safety for NHS patients, Britain's chief pharmacist said that "greater use of electronic prescribing in hospitals, barcoding technology and robotic dispensing have the potential to reduce the risk of medication errors." Oxford's John Radcliffe Hospital also uses barcodes for patients receiving blood transfusions, and uses it on the haematology ward to link patients with their blood tests.